Walkie Talkies are electronic communication devices used by soldiers. They were introduced during World War II. A Walkie Talkie can transmit as well as receive radio signals. Older Walkies were not secure as the enemy easily intercepted the radio waves signal. Modern Walkie Talkies are reliable as the communication between the caller and the callee takes place over a secure channel. Walkie Talkies are one of the favorite toys of teenagers and kids. They’re also used as a telephone alternative by professionals. Unlike military walkie talkies, commercial and kids WTs are cheap. You can buy them on Amazon or eBay for a price starting at $10. Do you know? You can convert your phone into a walkie talkie by installing apps that support Push-To-Talk protocol. The apps won’t place direct calls. They will use the phone’s Bluetooth, mobile data or WiFi connection to send and receive voice data. 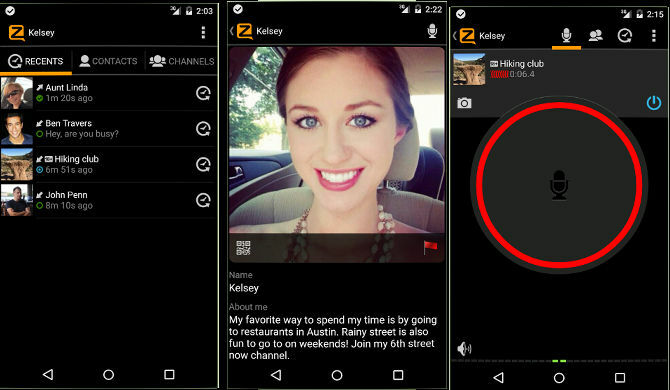 With 45+ million users, Zello is the most popular walkie talkie app on the Google Play Store. This application requires account registration and has numerous features. Once you register an account, Zello will prompt you to enter basic details for your profile. It also presents an option to set a profile photo. 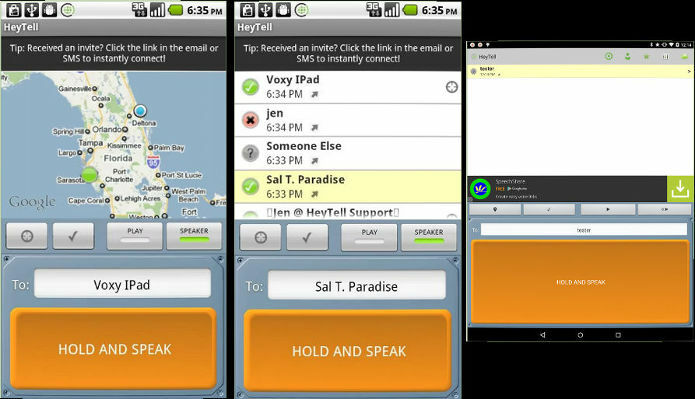 Zello ships with two color themes. To change the theme, the user must open the settings interface. The main interface of this app boasts three tabs – recent, contacts, and channels. If your friends use Zello, you’ll find their names on the contact list. The recent tab displays a list of calls you’ve made recently. The last tab i.e. Channels flaunts a list of channels dedicated to various issues and topics. Once you follow a channel, you can listen to the voice messages shared by other users. Channels you follow will appear in the Contacts tab. Zello provides an option to find a channel by name. It enables you to see the list of trending channels. You can mute a channel or delete it. 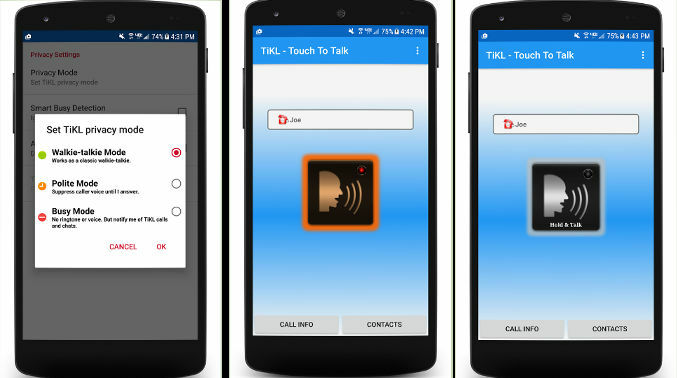 Zello supports Push-To-Talk protocol. Once you’ve configured the PTT button, you can start talking with your friend by simply tapping a button. Voice data transmission in this application is automatic. The sound clarity and quality depend on the quality of the microphone on the user’s device. The app allows users to set their text and availability status. You can see whether a contact is online or offline in it. If your friend is online, you can connect with him/her by tapping on the contact name. The app supports push notifications. According to its developer, Zello supports 2G, 4G-LTE, 3G, and WiFi network connectivity. 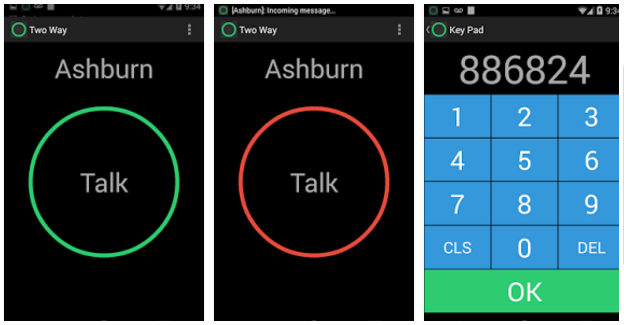 Two Way is easy to use Walkie Talkie app with a simple UI. Unlike Zello, Two Way doesn’t asks users to create an account. The main window of this app boasts a large round button. To start a conversation, tap the menu icon and select the keypad option. When you do so, you’ll see a 6 digit channel number. Note down this number and share it with your friend. Your friend must now connect his/her phone to this channel. Finally, you and your friend must tap on the large round button. That’s it! Two Way lets users talk with random users. It also allows you to engage in conversation with local people. TW is a lightweight application that runs on Android 4.0+ OS and IOS devices. HeyTell is a cross-platform walkie talkie/voice messaging app that allows you to record and send voice messages for free. Messages are transferred within 2 to 3 seconds of recording. When new users run HT, they’re asked to enter their phone number, name, and email address. The information you enter will be displayed on your profile. HeyTell has a clean user interface. To use the app as a walkie talkie, you must select a contact by tapping on the contact option. Then, you must tap the large orange button. If your friend isn’t using HeyTell, you won’t be able to send him/her the message. Once HeyTell transfers the message, it will display a push notification on the recipient’s device. The clarity of messages recorded with this application is excellent. HeyTel includes a voice changer function. It lets you listen to previous voice messages. HeyTell lets you invite friends via SMS or email. The invitation email and SMS includes a link to download the app from the Play Store or iTunes. HT supports Windows, IOS, and Android OS. 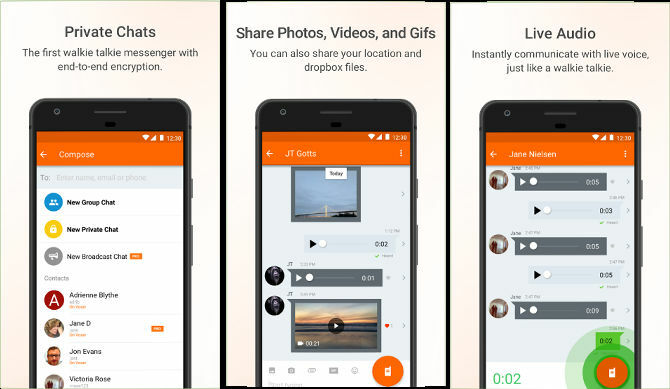 Voxer is a free walkie talkie app that allows you to exchange voice messages with friends in real-time. You can either listen to the message live or later with Voxer. This application offers a cool feature called private chat. When you enter into a private chatroom, you can send emojis, GIFs, URLs, pictures, or videos to friends. Messages transferred during a private chat session are encrypted with a powerful algorithm. Voxer deletes the private messages when you leave the chatroom. The app lets you mark messages as read. It allows you to create and share notes. It includes a search utility. Voxer enables you to disable unwanted notifications. By default, it adds your location to the messages. You can disable location sharing from the Voxer’s settings interface. TIKL is a free app that turns your phone into a powerful walkie talkie. It supports group and 1 to1 calls. TIKL displays a confirmation message when your message is delivered to the recipient. Voice messages recorded with this app are delivered instantly. TIKL uses mobile data or WiFi connection on your phone for transmitting messages. It lets you create a home screen widget. To use it, you must verify the phone number. TIKLis easy to use. It provides three privacy modes – walkie talkie, polite, and busy. Apart from contact numbers in your phone book, you can use TIKL to talk with Facebook friends. IOA is a great app to voice chat with friends or relatives staying within 105 feet radius of your proximity. 32 meter aka 105 ft is the maximum range of a WiFi router. The Bluetooth’s range is 33 feet. Your friend must be within 33 feet distance if you want to talk with him/her with IOA. The app is powered by a robust PTT algorithm and it works in offline mode. Unlike other apps that use mobile data, IOA uses Bluetooth and WiFi technology to function as a walkie talkie. Intercom for Android doesn’t require account registration. You don’t have to provide your email address, phone number to use this app. 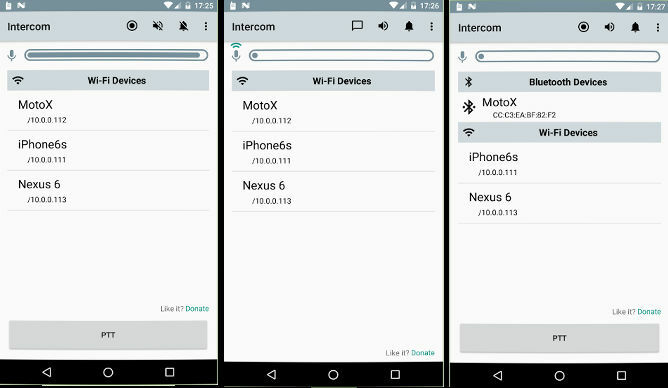 To use IOA, you must pair two devices via Bluetooth or WiFi. IOA, Zello, HeyTell, TIKL, Two Way and Voxer are the best walkie talkie apps for Android and iPhone.